During an intensely transformative and healing period, she was initiated and awakened to the world of the Spirit, the world of consciousness and energy. Until then, she was a computer programmer and was not actively pursuing the spiritual. Her healing journey has led to her current path as an energy healing facilitator, spiritual coach, workshop leader and teacher of various energy therapy techniques. Combining her intuitive gifts of claircognizance, clairsentience and clairaudience, she works with Angels and Beings of Light in her energy healing practice. She is trained as a Certified Clinical Hypnotherapist, a Reiki Master/Teacher, and a Certified Energy Therapist for EFT, Angel Healing and Soul Healing. Christine is honored to be certified as a TAT-Professional. Christine is changing lives by helping others awaken to the light within and trust their inner wisdom. It is her life’s mission to facilitate and guide others in their unique healing and transformational path to be free, joyous and fulfilled beings. 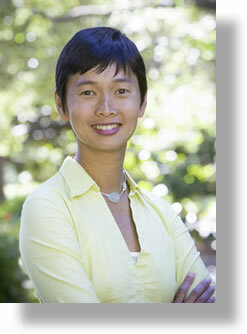 In February 2005, Christine founded Metta Center. Metta Center has the mission to connect each of us with the wisdom, magic, simplicity, trust and unconditional love that are always within us. She practices in the Montclair district, Oakland, California.